One of the questions that early childhood teachers often hear is, “when will my child write their name?” There is an inherent desire for children to know how to write their name that stems from a very basic human need to know one’s identity. 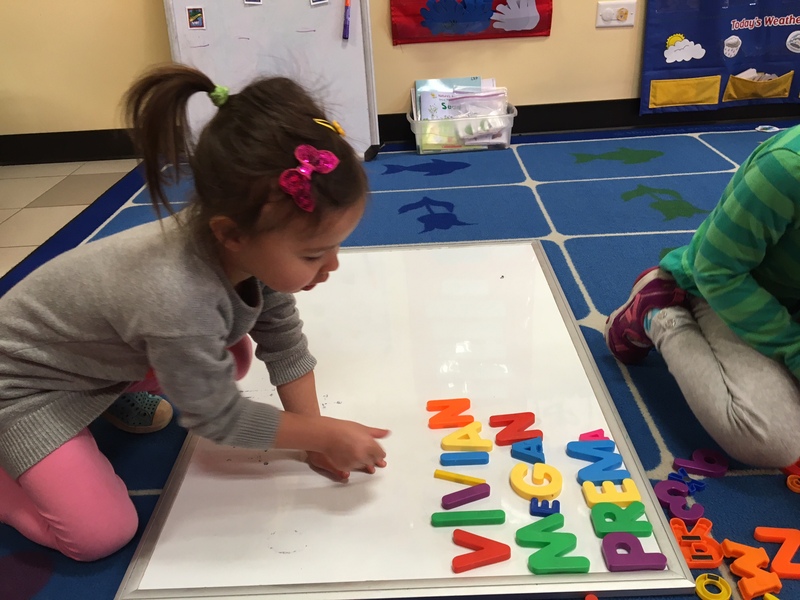 Name play in preschool also has many cognitive benefits which include the ideals that recognizing one’s name helps children feel important, recognizing others’ names builds community, name recognition builds concepts of print and begins the process of site reading, and knowing your own name supports beginning math concepts. One of the defining principles of child development-based schooling is the understanding that the development of fine motor skills must happen before children are asked to write their names. There are many ways to do this including: focusing on drawing with details (self-portraits, observation drawings in nature, sketches of creations in block area), playing with play dough (rolling with palm on table/between palms, squishing with fist, using finger and thumb to roll balls) drawing/tracing name in salt/sand trays, and using tweezers to transfer object and eye droppers to transfer water. These activities and more can be found within our classrooms as the teachers help support this fine motor development. To help support names as a piece of community, the children’s names are used in many daily routines within the classrooms, including: as a way to sign in and out of school, in taking ownership over one’s belongings in cubbies, as words on writing center walls, and as pieces in games such as name sorts where children can sort names from shortest to longest or try to match a friend’s name to their photo. As children engage in the above activities, they will eventually show us that they are ready to begin the actual act of writing their names. o are showing an interest in writing their names Generally, children are ready to start writing their names when they are: holding pencils with the correct grip or near correct grip, are creating recognizable drawings, and are able to tell you the letters in their names. At this time, the teachers help facilitate the children’s natural curiosity in writing their names; particularly as it relates to their day to day actions, such as in writing notes to family and friends, labeling their work, and making a sign to let someone else know that they are not done working with a particular material.